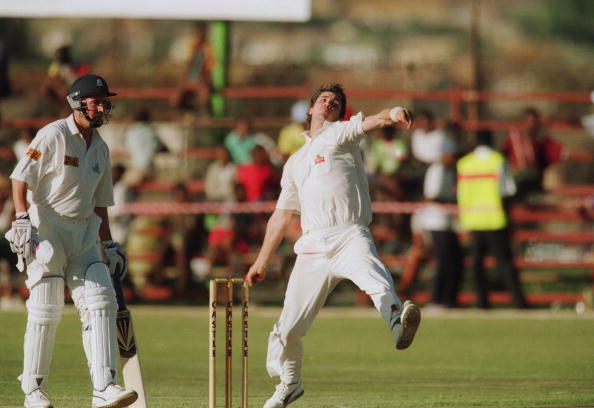 Meyrick Pringle, who celebrates his 50th birthday today, is our Legend of the Week. Pringle played his best ODI game at cricket’s biggest stage – the World Cup. Playing in only his second ODI game, and against one of the best teams in the tournament – Pringle introduced himself in fine style to the cricketing world. In the game South Africa batted first but struggled to 200-8 in their allocated 50 overs. The West Indian pace attack, who in, Malcolm Marshall, Curtly Ambrose, Anderson Cummins, Winston Benjamin and Carl Hooper– had arguably the bowling line-up at the tournament. But the Eastern Cape-born fast bowler outshone all to a Man-of-the-Match performance. Even more impressive at the tournament than the West Indian bowling line-up was the West Indian batting line-up. The South Africans were novices to international cricket, and first-time participants at the World Cup. They were expected to crumble against the West Indians, but Pringle had other ideas. He made his statement of intent early on when he took the wicket of Brian Lara – caught acrobatically at point by Jonty Rhodes – with West Indies on 10. He followed that up with that of Richie Richardson (1), Carl Hooper (0) was next, and Keith Arthurton (0) completed the disastrous top-order collapse. Pringle took four wickets for 11 runs at an economy rate of 1.37 in the match, to lead South Africa to a 64-run win. Pringle played four Test matches at a bowling average of 54.00 and an economy rate of 2.48. He also represented South Africa in 17 ODIs at an average of 27.45 and an economy of 4.16.